Siren’s Fury (right) has swept down the outside to win the Star Kingdom Stakes at Rosehill. Siren’s Fury has come from behind to take out the Star Kingdom Stakes in a photo finish. 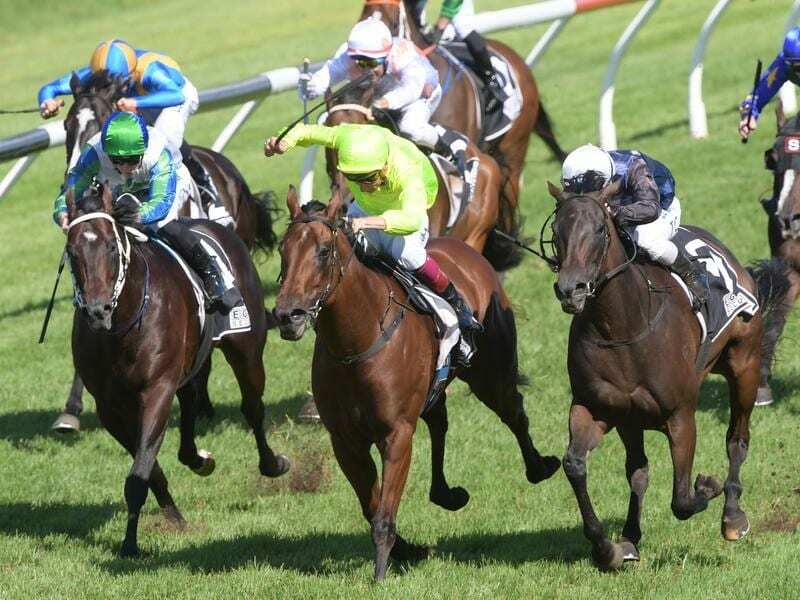 The five-year-old mare faced a depleted but speedy field in the 1200m race at Rosehill on Saturday before overtaking Manuel at the final moment to win. “Mid-race when she wasn’t really travelling that strong, she was sort of only just keeping in contact (and) I guess the positive thoughts were slowly going away but she’s always strong late and it was good to see her charging the line,” trainer Jason Coyle said. Coyle was hopeful the mare could go up another level on the heels of her success. Coming off the gutsy ride, Clark said the outcome came back to the speed of the race. “She was off the bridle a long way from home, she was always going to be strong late with that 1400 under her belt and that was the key,” he said. Last year’s Golden Slipper winner Estijaab led but fell back to finish last with jockey Brenton Avdulla telling stewards she struggled on the heavy track.